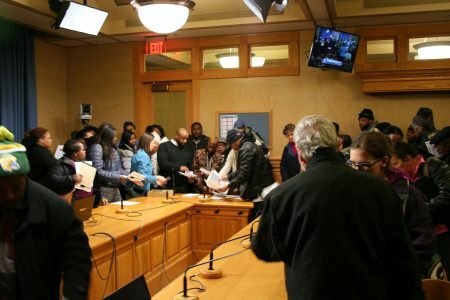 An informational meeting Monday at City Hall disappointed hundreds of city residents hoping to take advantage of a new program that will sell city-owned foreclosed properties for $1. Only developers can purchase the properties. The recently announced City of Milwaukee program allows developers to buy city-owned foreclosures in the greater Sherman Park area for $1; they would be required to employ one unemployed or underemployed individual on each project. Participating developers also will be required to buy at least five one- or two-family homes, and will receive a $10,000 grant per home. Developers must renovate the homes to be code compliant and can rent, offer a rent-to-own program or sell to owner-occupants once the repairs are made. According to Department of City Development (DCD) officials, the Milwaukee Employment/Renovation Initiative (MERI) is a response to sometimes-violent demonstrations in August that occurred in the wake of a police killing for which the officer has since been charged. The Wisconsin Department of Financial Institutions committed $2 million for housing rehabilitation, demolition and deconstruction, $1 million of which will go to rehab properties in the area bounded by Lloyd Street, Capitol Drive, 60th Street and 20th Street. District 7 Ald. Khalif Rainey, who represents the Sherman Park area, called MERI “the mayor’s proposal” adding the Common Council did not have the discretion to structure the program as they liked. Rainey said he and District 15 Ald. Russell Stamper, who co-sponsored the city legislation with Ald. Michael Murphy, had to push for home ownership to be an aspect of the program. “We did the best we could to make it the best for the people who live in the neighborhoods, and the people who [are] actually going to be there on a regular basis,” Rainey noted. Mayor Tom Barrett’s office did not respond to requests for comment. Carl Quindel, president of Strong Blocks, a Milwaukee organization that helps renters become homeowners, commended the city for trying to find a way to “dispose of tax foreclosures in a responsible way” and said he hopes this program will be another tool for them to do so. Still, he said whether or not that’s the case will likely rely on how the program is implemented and what developers are selected as partners. According to DCD, there are 200 city-owned homes in the area defined by MERI. The hope is that 100 of those homes will be renovated as part of the program, said Deputy Commissioner Martha Brown. As of Dec. 8, the city owned 1,251 foreclosed buildings, about 90 percent of which are residential properties. The number of properties acquired by the city has steadily risen since 2009, when it acquired 461 properties. Rules changes in 2015 allowed the city to foreclose on homes that are tax-delinquent for a year, as opposed to waiting three years. It has acquired 1,870 properties since 2015. Mayes said he would like to see houses in the area be brought back to livable conditions, but was skeptical of outside investors with no stake in the community acquiring assets in the neighborhood. He said the focus should be on addressing poverty, crime and employment in the area. The eastern end of the defined area overlaps the 53206 ZIP code, the poorest in Milwaukee, where almost 48 percent of residents live below the poverty line. Ninety-four percent of the residents in 53206 are African-American, according to the 2015 American Community Survey. Two other ZIP codes, 53216 and 53210, cover the western end of the area; both have poverty rates above 25 percent. DCD spokesman Jeff Fleming said that the goal is to “turn vacant, city-owned homes into neighborhood assets” and to provide employment opportunities. “Our aim is to build on the existing strength of the neighborhoods,” wrote Fleming in an email. According to the MERI Request for Qualifications (RFQ), developers must employ an unemployed or underemployed individual for at least 500 hours on each property. The individuals must be referred by a local construction trades program or Compete Milwaukee, a city-run transitional jobs program; or must be certified under the city’s Residents Preference Program (RPP). Mayes, who was previously a construction supervisor at Milwaukee Community Service Corps (MCSC), said renovation projects are “not a one-person job” and there should be more disadvantaged workers employed on MERI rehabs. Alice Hungerford, finance manager at MCSC, confirmed that crews of 10 to 12 people work on larger residential renovation projects. Mayes, Givens and many others said they would have liked to see the opportunity to acquire city-owned property extended to community organizations and individuals who live in the area, as well. Darrell Marbley, pastor of Westside Missionary Baptist Church, who has lived in Sherman Park for more than 20 years, said he understands why the program was structured as it is but that the developers who were at the meeting are not from the area. “That’s not a recipe to keep that community afloat,” he said. Juli Kaufmann, a developer who has worked in the Lindsay Heights neighborhood and primarily deals in commercial property, also questioned whether a $10,000 grant is enough of an incentive, considering the repairs that will have to be made. According to DCD, the average scope of work per home is about $50,000 in the designated area, but many homes exceed that figure, according to the RFQ. Kaufmann said, instead, the goal should be to maximize home ownership. Michael Gosman, executive director of ACTS Housing, an organization that has helped connect more than 2,000 people with homes in the central city over the last 20 years, agreed. 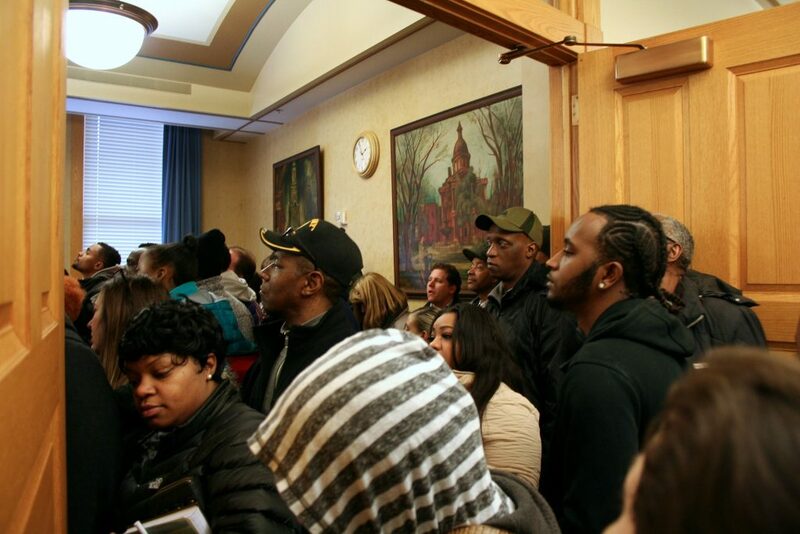 Bianca Shaw, a former Sherman Park resident, spoke to a packed room at City Hall Monday. “This is not for us,” she said, referring to the program. Editor’s note: This story has been updated to include Ald. Michael Murphy as a sponsor of the legislation. As the photo suggests, there are many who care deeply about their neighborhood and want to be part of its improvement. Tax foreclosed properties are one very important component of a neighborhood revitalization strategy that ought not be reduced to liabilities remedied by financially-biased RFQ’s. Over 20 years of work and life on the west side has proven to me that its greatest shortcoming is City Hall’s inability to tap into the deep social resource base found there. People will invest and reinvest in their community when provided the tools, access and resource others have, if provided access. I have, but I question if that access is offered today. Prior to opening our own business in a tax-foreclosed mixed use property 10 years ago, I found that matching local talent, capacity and resource to take on housing projects in 53206 or 53208 was more art than science but the yield was three-fold that of an investor. First, wealth is recycled in the community, stemming a trend exacerbated by the housing boom that displaced local owners and redirected cash flow out of this city. Two, social and labor networks form around housing rehab. As housing is often the primary economic driver of low-income residential neighborhoods, those who are locked out of the traditional labor market often find work in housing rehab – they ought not be locked out of that market or relegated to ladder holder for an investor from elsewhere who wants to pay for their kid’s college tuition through a few central city duplexes. Three, humans have housed themselves for millennia, we are a capable species. What made me invest in Walnut Hill was the power of the duplex. While many renters pay 1/3rd or more of their income to rent, a single rental unit in a duplex can pay for the property, as long as the owner is willing to do the work needed to perform basic maintenance of the property. I call it simple home economics. This is why an investor requires so much subsidy for scattered rentals. They must pay for all work to be done since they have no local network to support their modest investment and there is little long-term appreciation of it. Of the roughly 500 City-foreclosed properties sold in 2016, how many became owner-occupied? To maintain the owner-occupied count, it would need to be over 50 percent. There is no proof that an emphasis in outside investors has helped solve the problems Milwaukee faces. We need to support residents in that hearing room and find ways to ensure they have access to City assets, in this case foreclosed properties. Thanks, Mr. Boucher. I hope City Hall is listening. I am still questioning the reason why there is so much interest in Sherman Park. This level of commitment based on what happened in that community in August 2016 is misguided. This should have been an initiative for all low income communities with the issue of foreclosed properties long ago. It seems that because of the large Jewish population that resides there and the need to retain other “good neighbors” is the driving force. I agree wholeheartedly with David who spoke so eloquently in his comment and laid out all the factors of why there should be a resident and community organization involvement in the rehab of the foreclosed properties in Sherman Park. I cannot understand why we still offer time after time great solutions for addressing the problem but our lawmakers fight us relentlessly to ensure that their criteria is met but always with the wrong people. We need to stand silently in unity on pushing for a realistic approach by and for the people of Milwaukee. While mayor Barrett is known to be a complete scum bag this may not be his worst screw up. Selling homes to residents at a discount is probably a lost cause. The community has shown over decades that they cannot maintain these properties. That is why they are run down and vacant in the first place. Ok all this about the Mayor is correct ! This man and many like him are driving this city into the ground and taking the sherman park people with them. They do NOT care about you people. Just the idea that we sell off land or old homes or new arena properties for $1 tells me they think your all a bunch of idiots. Trust me they have their minds made up and you matter little. So Remember when it comes time to vote no matter which election vote the incumbent person out. That includes the alderman and common cousel people. This is a Joke gone wild.